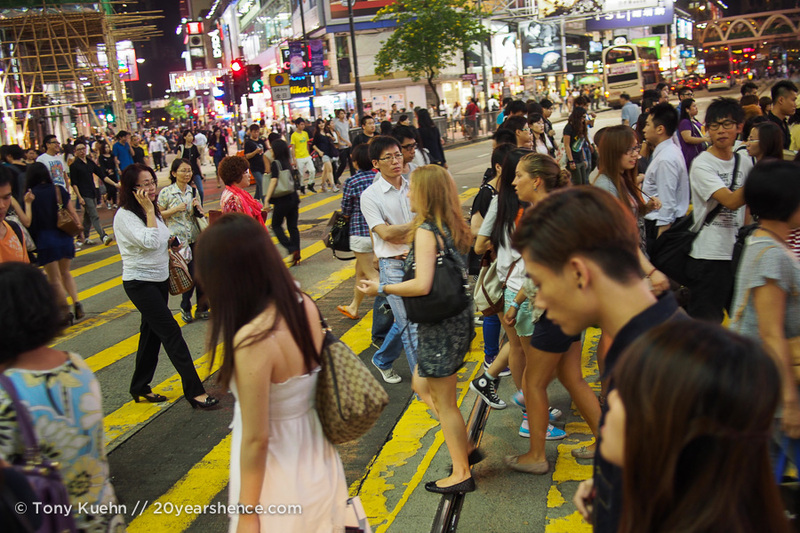 The first thing in Hong Kong we notice is the people. They are everywhere at all times. We arrive at our hostel at 1:30 in the morning and there are still people roaming the streets, cars honking and buses moving from stop to stop. The city is in a relative calm, but we don’t know that yet, and we’re suprised to see anyone at all. We retire to our beds and anticipate the days to come. 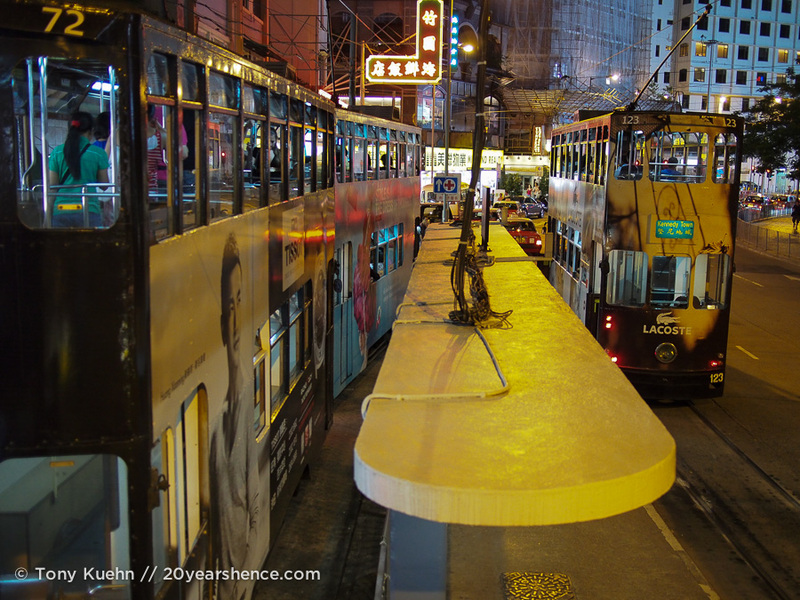 As we step out of our hostel on our first day in Hong Kong, the city rushes up to greet us. Our door opens into a line of people waiting to get on a green minibus to Stanley. We’re not going to Stanley, so we make our way down the narrow sidewalk, dodging others who are, and we head out to the main road. 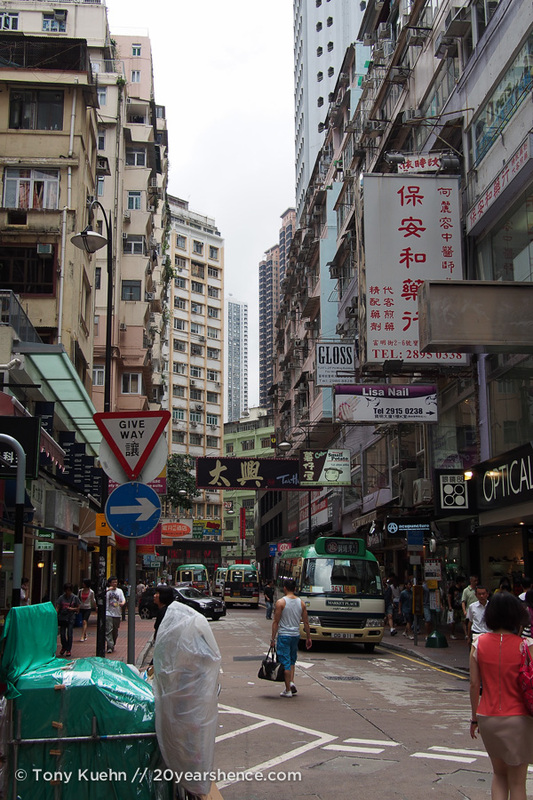 During the day Hong Kong’s background noise is the sound of shoes hitting pavement. The omnipresent slap of soles meeting concrete mixes with a chorus of voices and provides the soundtrack for our walk. We feel briefly overwhelmed as we are hemmed in on all sides by people rushing somewhere. Steeling ourselves and picking a direction, we head off, hoping we’re going the right way and hoping the city doesn’t simply swallow us whole, never to be seen again. Waiting to cross the street among hundreds of people doing the same thing, we watch for the light to change and listen to car horns honk at nothing, as traffic crazily weaves its way down the asphalt. Huge double-decker city buses blast down the road, screeching to a stop only to roar away moments later in a cloud of diesel fumes, pausing only long enough to belch more people into the crowd already surging at the curb. Minibuses swarm the roads filling in the gaps in traffic and leaving smaller clouds of exhaust behind them. The distinctive ping-ping of the bells of the “ding dings” (double-decker trolley cars) cuts through the noise at irregular intervals as they near their stops, sometimes in clusters, each one waiting for the other to pass, or all paused as a glut of people haphazardly crossing the street blocks the tracks. The ground rumbles as the ding dings slowly trundle around corners: their wheels are comically close together and are set in the middle of the carriage, causing the whole car to rock back and forth at any change in velocity. Slowing down for every turn, they remind me of a refridgerator on a single roller skate being pushed through an impossible maze. Like little, unstable skyscrapers they push their way through the crowded streets in an endless loop. Moving again, we make our way down the sidewalk, dodging drips from overhead air conditioning units and watching for dips and rises in the pavement. The smell of fresh pastries, and garlic, and chili, and tea, and chicken and a hundred other foods drifts under our noses, mingling with (and sometimes winning over) the exhaust and metallic tang that cling to the buildings. Hong Kong has a smell all its own, and we love it. We feel the blast of cool air from an open doorway and hear the buzz of neon signs carelessly left on from the previous night. All the while, we weave through the crowd, heading for the metro and the subterranean sea of humanity flowing just below our feet. Another traffic light turns red and we stop to look up at the impossibly tall buildings all around us. Cars and buses race past us, weaving like ants among tall grass. We imagine the people, 40 stories above us, looking down from their work to watch the river of colorful dots and dashes flow around the buildings in a never-ending parade and for a moment we feel very small. The light is nearly ready to click to green again, but most people have already began to step into the street, eager to be moving once more, carrying us along with them. The mouth of the metro is set into the side of a building, and as we climb up three stairs (and then down many more) the noises of the street are replaced with the echo of voices and the musical beeping of people passing through turnstyles on their way to the trains. After a few moments I realize there is a literal soundtrack playing along with the beeps of the metro gates. The irregular beep-boop of the metro cards (octopus cards for those in the know) mingles with the gentle deet-doot-do of the music, mixing to create an altogether pleasing new song, unique to every moment and every person who enters. This planned, subtle, choas of music and noise is the perfect counterpoint to the raw disorder of the streets above and we find it oddly soothing. The train whistles up to the station and hisses to a stop, the doors slide open to disgorge a mass of riders and we make our way inside. As the doors close with a small thunk we grab the handrail and lean forward as the car shoots down the long, dark tunnel ahead. Crammed into a metal tube with hundreds of other people, this is perhaps the quietest part of our morning so far. Despite this, we’re eager to dig our way back up to the surface and wander among people and buildings of a city that has already captured our hearts. 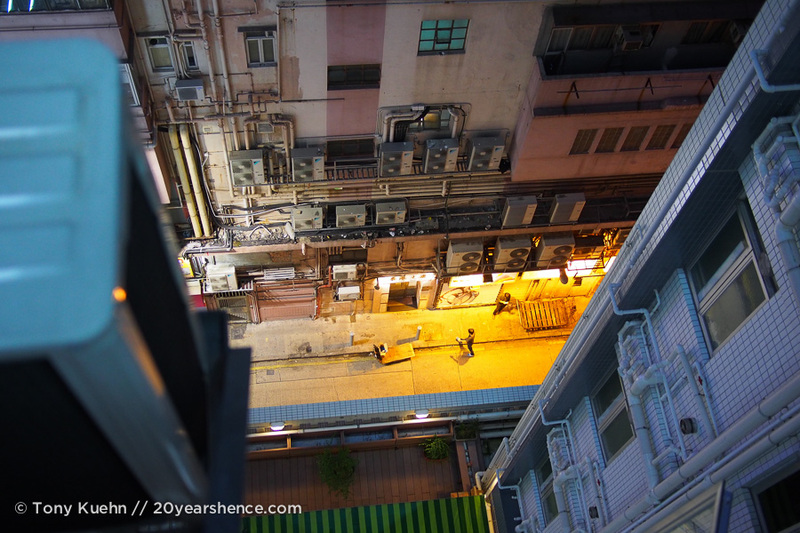 The streets of Hong Kong are a noisy symphony of movement and life. They are vibrant and fascinating, offering something new with every passing moment. It’s easy to be overwhelmed at first, but the people are friendly, the food is good and the scenery is remarkable, and soon enough we found Hong Kong seeping its way into our consciousness, slowly becoming a part of us and we feel richer for it. 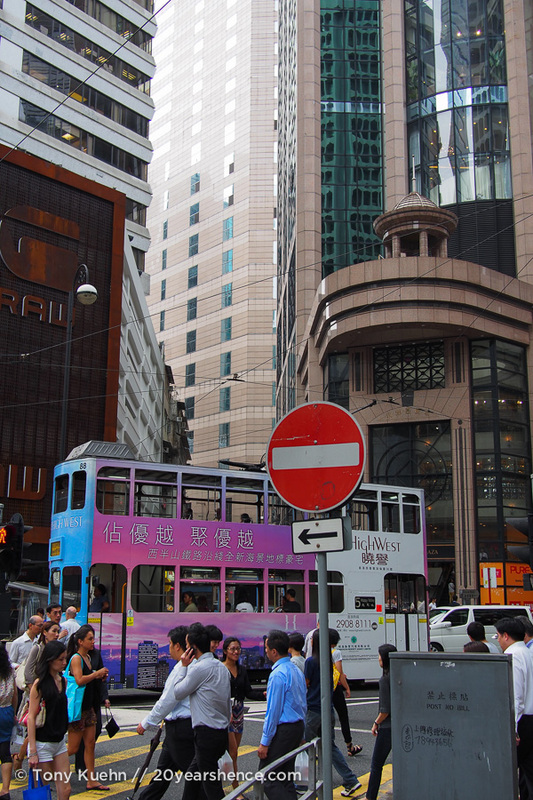 If you’ve ever enjoyed a city, liked walking on concrete, and relish observing people in one of the world’s foremost urban jungles, there is no more interesting place than Hong Kong. The sights, sounds, smells and tastes, comingle to form the very soul of this city, and all were so much grander and exhilarating than we expected. Those subway trains look a lot like the ones in Tokyo except that it seems much crowded here? Lovely post, I could only stroll the airport in Hong Kong. 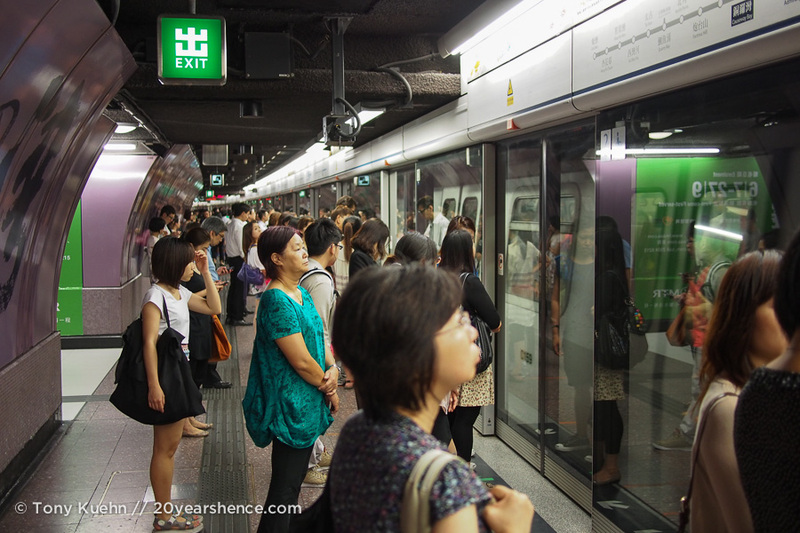 Sometimes the HK metro felt more crowded than Tokyo’s system for sure, which seems crazy, I know. However, the HK metro is mostly much newer than Tokyo’s and there is a barrier with sliding doors between the train and the platform at most stations, so it has a distinctly different feel. It’s a shame you didn’t a chance to go into the city, hopefully one day! The airport is quite a ways from HK proper! Yeah, it’s not a good place for someone who is uncomfortable with crowds! The food and the crazy city are well worth it if you can push through though! Thanks! It really stuck with us… every few weeks we say (half joking) maybe it’s time to go back! I think this is the most favorable description of Hong Kong I’ve ever read. I’m so glad you’ve found city that suits you so well! It’s nice to hear a positive experience in what could be a very intimidating city. It is certainly intimidating for the first-timer, but jumping in with both feet is the best way to go! After a little while it stops being overwhelming and just becomes fun! That is exactly how I picture Hong Kong!! I love each city’s distinctive “smell” (even when it isn’t exactly pleasant)! Rika | Cubicle Throwdown recently posted..New home, new job, new laptop charger. Yeah, the big cities all have their own smell. Usually it’s at least interesting, though, on occasion, it’s… not so great (I’m looking at you Beijing). You paint a vivid picture of both Hong Kong as a place and what daily life is like for a traveller (which I always find fascinating!). As always, your pictures are brilliant too! Thanks so much! HK made quite an impression on us! Great description of what to expect as a tourist in Hong Kong.Planning a trip end of the month for xmas and newyears and looking forward to experiencing these sights,sounds,taste and feelings now! !Brillant pics too.. Thanks so much! I know you’ll have a great time in HK, it seems like a good place to be for the holidays.